Worms can learn. And the ways they learn and respond to danger could lead scientists to new treatments for people with neurodegenerative diseases. University of Iowa researchers researchers studied how roundworms—some of the most abundant animals on Earth—react to stressful situations by exposing them to the scent of a lethal bacterium. 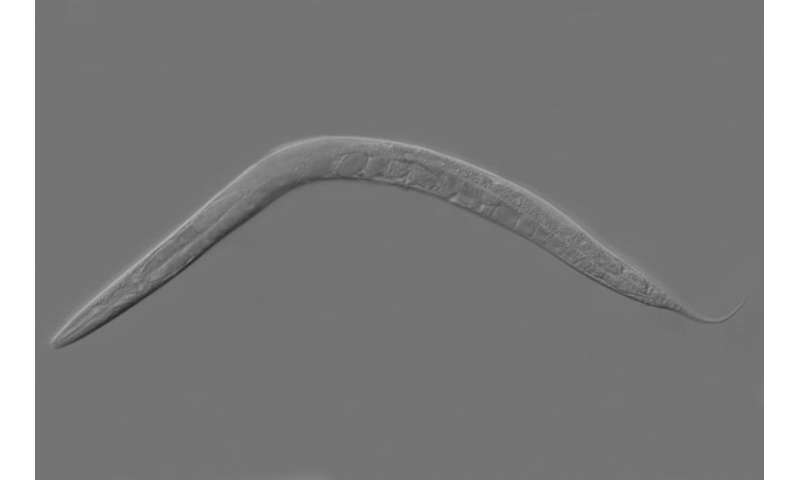 One group of roundworms exposed to the smell primed a defense mechanism that, when activated by stress, protected the worms' cells and increased the cells' survival. The group that wasn't exposed to the odor didn't prime its defense systems. When both groups were put in physical contact with the deadly bacterium, the roundworms that were exposed to the smell activated their cellular defenses more quickly, and more survived. The finding could usher in a new, non-pharmaceutical approach to treating neurodegenerative diseases such as Alzheimer's and Huntington's. These diseases occur when nerve cells in the brain or peripheral nervous system become damaged, lose function over time and ultimately die. Although treatments may help relieve some of the physical or mental symptoms associated with neurodegenerative diseases, there is no cure or way to slow the progression of these diseases. The research also could help with disorders associated with aging, such as dementia, which involve the accumulation of protein damage in cells that the human central nervous system does not address, for reasons largely unknown. "Theoretically, it should be possible to treat these types of diseases if we can figure out how to stimulate that defense mechanism in people and have it activated more consistently to fix damaged cells," says Veena Prahlad, assistant professor of biology at the UI and corresponding author on the paper, published Oct. 17 in Science Signaling. "We'd need to find the same sensory triggers in humans as we have demonstrated...in worms." The researchers zeroed in on a defense mechanism common to all plants and animals known as the heat shock response. This mechanism—activated by changes in temperature, salinity, and other stressors—triggers the production of a class of proteins called molecular chaperones, which seek out and repair or get rid of damaged proteins that have become toxic to the cell. The goal is to prevent an overload of damaged proteins in the cell, which would kill it. In humans, as in the roundworms studied by Prahlad, a key protein involved in synthesizing molecular chaperones is called the heat shock transcription factor, or HSF1. Researchers know that HSF1 plays a role in guarding against protein damage in neurons that can lead to neurodegenerative diseases. But they thought it was activated only as a response to an overload of damaged proteins in cells. But Prahlad, who has studied HSF1 since she was a postdoctoral researcher, hypothesized it may be more than a reactive element. Maybe, she thought, HSF1 could be put on standby, and thus, could be activated more quickly when a threat occurs. A big test of her idea came when she and UI graduate student and first author Felicia Ooi exposed one group of worms to the odor of the deadly bacterium PA14 while another group was given the odor of a different, benign bacterium. The group exposed to the PA14 odor activated twice the number of molecular chaperones than the group given the benign odor. Moreover, the worms exposed to the PA14 odor had a 17 percent higher survival rate after 18 hours than the worms given the odor of the benign bacterium. Prahlad says she thinks the worms exposed to the PA14 odor "learned" the smell—and the threat that it presents—and stored that memory. "We show in this paper that (the HSF1 response) is not a reaction," says Prahlad, who also holds an appointment in the UI's Aging Mind and Brain Initiative. "The animal turns it on in anticipation, and it does that by learning about the threat in its environment." The question is whether a similar trigger can be found in humans to boost serotonin, a chemical linked to a variety of neurodegenerative disorders, and is required to put HSF1 on alert. It's that prospect that excites Ooi, who joined Prahlad's lab in 2012. "Everybody goes through aging, and this research is highly relevant to many of these neurodegenerative diseases that currently have no cure," she says. "So I'm interested in exploring these avenues to treat them." The paper is titled, "Olfactory experience primes the heat shock transcription factor HSF-1 to enhance the expression of molecular chaperones in C. elegans."